It was quite daunting knowing that I was going to be providing healthcare to sick patients in a country where I didn’t speak the same language as the majority of people. Back home, overseas doctors are required to pass a PLAB (Professional and Linguistic Assessments Board) exam before they can practice medicine in the UK. Yet, I started working here in Zamia with only a few Chichewa words at my disposal. My Chichewa vocabulary has definitely improved during my time here, and my ‘lost in translation’ problems have reduced. I can get by on ward rounds and in simple consultations without the need for a translator, but I don’t think I would do very well if I were required to sit an exam. I know that I use phrases that are grammatically incorrect, I ask single word questions, and frequently have to say ‘pepani, sindikumvetsa’ [sorry, I don’t understand you] while I look around for someone to translate for me. Yet, my good-natured patients smile and laugh at me, and patiently listen to my awkward questions ‘chimbuzi kangati lelo?’ [bowels open, how many today?]. However, more interesting is the impact that Zambia has had on my English! My Zambian colleagues all speak excellent English, but with a Zambian flair. As time goes on, I seem to be picking up some quirky expressions and noises. When speaking to my Mum recently, she told me she had a mouth ulcer, and I said ‘Oh no, is it paining?’ which I immediately realized made no sense to her, and I quickly said ‘I mean, does it hurt?’ I also listen to the conversations taking place between myself and the other British doctors at the hospital, and smile as I hear spatterings of Chichewa and Zambianisms sneaking in. The multi-toned ‘ooo-uuu-ooh’ noise made by Zambians in exclamation has been adopted by all of us, and we now use it without thinking about it. So, at dinner, you might hear ‘There is cake for dessert tonight!’ followed by a chorus of appreciative ‘ooo-uuu-oohs’. One of my other favourites in Zambian English is the added sound at the end of words. 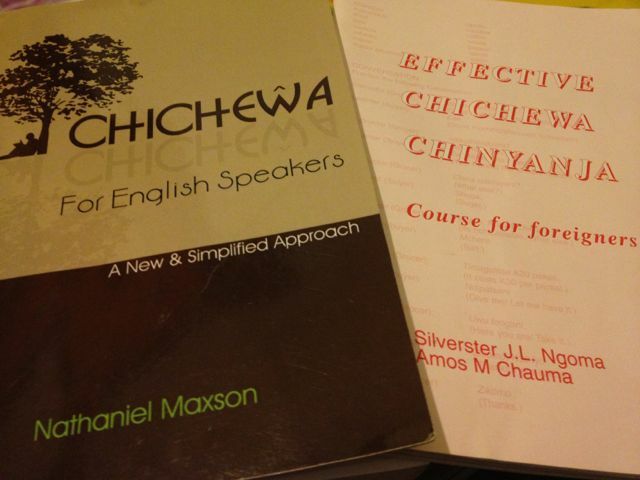 Every syllable in Chichewa ends with a vowel. This means that if an English word has consonants clumped together, an ‘a’ sound is often inserted to link up them up, e.g. ‘hookworm’ becomes ‘hook-a-worm. Similarly, if a word ends in a consonant, an ‘ee’ sound gets placed at the end of word, e.g. then-ee. To add extra complexity, the letters ‘R’ and ‘L’ are interchangeable. From what I can gather, more often than not ‘R’ seems to be pronounced as ‘L’ and ‘L’ as ‘R’. There is British doctor called Rebecca here, who is now known as ‘Dr Labecca’, and a Charlotte known as ‘Dr Sharrot’. When I asked a patient what her baby was called, she replied ‘Bracings’, but I found out later he was called ‘Blessings’. I asked someone at work to recommend a bar in Chipata, and he told me to go to Bruggums. I spent the evening telling people I was going to Bruggums, but when the taxi pulled up to the bar, through a grove of blue gum trees, I saw the sign for ‘Blue Gums’. That’s funny, asking your mother, “Is it paining?” I wonder if the lingo you’ve picked up will persist once you return home. If so, you’ll likely get some confused looks from time to time. My sister’s name is Charlotte, so I’ll have to call her “Sharrot” and then tell her why. With “ee” added to some words, then the word sun would be “sun-ee” (sunny!). Your stay in Zambia sure has presented a lot of challenges, but it sounds like you’ve handled all of them, including language, very well indeed. Here’s wishing you “rots of ruck” in your remaining time there.